I'm writing up work I did last week, btw... it's not so fresh in my mind now. The dump was still working, but I didn't want bloody notices spewing out on my screen. PHP, your way of handling exceptions / errors really fricking sux. If something goes wrong... raise an exception. Don't just put a bloody message on the screen (on the screen!!!) and keep going! And this is before I get to the matter of un-catch-able runtime errors, and exceptions which can't be caught. You muppets. Basically I now expect any sort of whitespace between new and dBug (as long as there's at least one bit of it), and there's an optional namespace declaration there too (any characters at all, ending with a backslash just before the dBug). I've put a pull request in to have that fixed. OK, so having done a composer update on that, my PHP test of dBug works fine. Now I need to work out what to do to make it work in a Twig file. The key bit here being the TwigServiceProvider bit. That loads Twig. That's about the best place for it, I think? 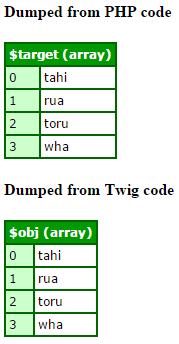 I thought about registering all of Twig in here, but thought it'd be messy, and there's really no point. I'm OK with registering Twig itself in the usual way, and then adding my extensions separately, in my own service provider. Here I call dBug from both the PHP code and the Twig code, and the way to do it is analogous in both situations, and pretty simple from Twig. Nice. And adding a label argument wasn't going to be straight forward due to the way it's coded. I might have a look at these as a side project. However for dumping objects and arrays, it's just fine, so that's gonna be a help to us. Note I have separate -dev and "non-dev" requirements and autoload sections. By default Composer will install / load everything, but there's a -no-dev option one can use with composer update which we can use in production to not install dev stuff. Nice! I'm finishing this in a bit of a rush as I need to crack on with work, and I'm running out of time to proofread this before I need to get back to it. So I'll leave you there.